The cooperation between the Pharmacy Department of Omsk State Medical University and Omsk Pharmaceutical Industry has a long and rich history. The tradition of giving seminars and lectures on new preparations in chemist’s shops by the University staff for chemists and practicing doctors was implemented decades ago. The foundation of the Pharmacy Faculty gave impulse to the development of OSMU cooperation with network of pharmacies. The pharmaceutical industry greatly needed the specialists, and OSMU was charged with a task to train specialists for particular Omsk pharmacy organizations. 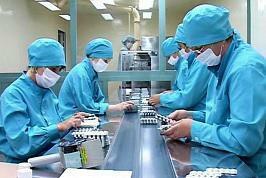 “The peculiarity of “Omsk drug” pharmacy network is the availability of existing pharmacy production. While it is almost cut down in the country, in Omsk we have an opportunity to develop exclusive medical formulations. Such cooperation greatly contributed to making lives of many patients easier. In the course of cooperation between OSMU and “Omsk drug”, prophylactic anti-caries toothpastes and gels, which were developed at the Research Laboratory of the Dentistry Faculty, are successfully put into production. Thus, Omsk residents can buy preparations developed by scientists of Omsk State Medical University in pharmacies of the City.